"The Ice Cream Parlor Sketch" - a wonderful list of ice cream flavors that boggles the mind. A masterpiece of comedy writing and delivery from Ronnie Barker. Not surprising to find that this is one of my top 10 ice cream recipes. 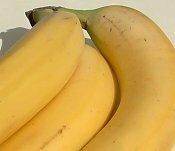 It's easy to make and with bananas being pretty much universally popular, it's a good bet for an ice cream if you have to make a batch at short notice. Method: Peel and chop the bananas into chunks. Place in a mixing bowl and mash well. Stir in the cream and then the sugar. Mix well. Chilll in the refrigerator for 2-3 hours. Extras idea - 5 minutes before the end of the freezing time add some small fudge pieces or mini marshmallows or choc chips. It's great fun and means you can use the same recipe over and over and never get bored. Read more about adding extras to ice cream recipes. This banana ice cream recipe is one of my top 3 easy ice creams you can make at home. It's incredibly popular with kids and adults alike. 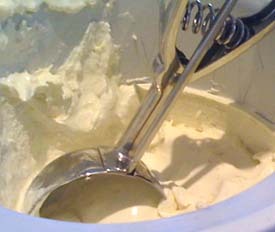 Follow the navigation bar for links to both popular and unusual recipes for homemade ice cream. You might also find my videos page of help too as there's a clip of me making this very same banana ice cream in my kitchen. You won't believe how easy it is and if I look like I'm having fun, you're right. I just love making ice cream and sharing my recipes. I hope you enjoy making yours as much. When you've made your ice cream, there are lots of ways in which you can present it. 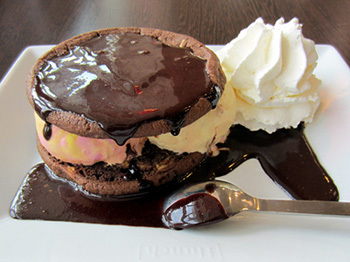 My favorite way is to create a great ice cream sundae but there are plenty of other options including making an ice cream sandwich using big chunky cookies as in the photograph. Don't forget the obligatory dollop of whipped cream and oodles of hot chocolate sauce as well, making an ice cream sandwich that will tempt anyone! I'm particularly delighted to share this photograph with you and hope it inspires you to make your own ice cream, sundaes and sandwiches.